Premier Jewelry that will last a lifetime requires the right Jewelry Storage solution. There's a right way and a wrong way to store Jewelry. Shop for a Jewelry Armoire Here! Before you Store Jewelry - Clean it first. Because according to the Mohs Scale of Hardness your jewelry is allergic to dust, yep - Dust! Who would have thought that dust particles that you can't even see with your eyes would be a girl's best friend's worst enemy? Click Here for Jewelry Cleaning Tips & Techniques. Click here to find out what jewelry can and can't be used in the ultrasonic jewelry cleaner. Please note, not all types of jewelry and in particular fine estate should not be cleaned in the sonic jewelry cleaner. There are purpose built jewelry storage organizers designed especially for traveling, called jewelry travel cases. Back home, let's start with what many women consider to be the queen of jewelry boxes for jewelry storage - the Jewelry Armoire. This is one box that is sure to please more than a box of chocolates. Listening men? 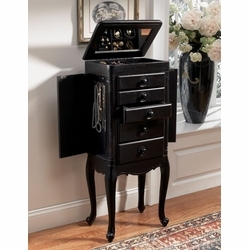 A Jewelry Armoire looks great, they're functional and you will find one to compliment your existing furniture. If space is not available, no problem, there's even a jewelry Armoire that can be fitted onto the wall! Over the years, people have shared with us similar stories, namely that they have divided their collections and put their jewelry in dozens of smaller jewelry boxes hidden around the house, while other collectors have told us they have it locked away in their safe box. Fire proof safe boxes are preferably and bank safe deposit boxes (interesting story further down) are considered one of the safest places for the safe-keeping of your estate Jewelry. Or are they? Can the government seize bank safe deposit boxes? To keep your Jewelry safe and secure, and in the best possible condition, choose a home-safety deposit box, lock-box, traditional handcrafted jewelry boxes, Jewelry organizer, Jewelry armoire, non-traditional unique Jewelry box or burglar-proof gun vault, (if you dare) with care and finesse. It's important! Convenience, fire and theft are good reasons why antique jewelry investors, may have a fire proof safe installed or use bank deposit boxes and document their possessions using Home Inventory Software Systems. If you run a jewelry business and need to photograph jewelry regularly, it may be more convenient to use a safe deposit box in the home rather than bank safe deposit boxes. Some collectors actually "hide" their "good bits". If you're one of those people, that have given-up on jewelry storage solutions, there are a couple of things to keep in mind. Some people choose to hide their Jewelry and over time as memory declines, they forget where they put it! Yep, it can happen. Over the years your personal repository may fade into oblivion or in the unfortunate event of death, (if know ones knows their whereabouts) your treasures may never be seen again. Some people tell a trusted relative where they have hidden their Jewelry. One of the best ways to safeguard yourself and your heirs from a disaster, such as this ever happening to you, is to organise now your personal record and vital information with Home Inventory Software. Home Inventory Software is an easy to use software solution that provides a way for you to document your possessions, including your jewelry, in any event from the total loss of the items, due to Theft, Fire, Flooding or Natural Disaster. Your personal jewelry storage requirements are contingent with the type of jewelry you own and the size of your jewelry collection. The jewelry storage tips that follow will help you to know the most appropriate way to store your jewelry inside the jewelry box. Never place your antique diamond earrings loose on a jewelry storage tray. Only diamond can scratch other diamonds and this method of storage facilitates this. Earrings should be stored on an individual earring pad that allows separate face up storage for each earring with the friction or screw back attached. Disarranged, tangled and knotted chains during storage can damage your jewelry. It can also be very frustrating trying to untangle when you have an appointment. Wooden jewelry boxes that have pendant hooks built into the inner lid or a side panel will allow you to store the chains in the hanging position and secure the pendant itself snugly inside a shirred pouch. Many jewelry boxes feature watch forms that allow you to store watches on a round form with the clasp secured and face up just like you wear it on your wrist. You might also like to take a look at the handcrafted jewelry boxes from Agresti, they are superb, this company even make their own Agresti watch safe. Best stored on a pillow inset in your jewelry box. The pillow provides gentle support in its own special compartment to keep the bracelet from colliding against other jewelry. Some gemstones are quite soft and easily damaged by hard gemstones like diamonds. It's not just a cunning example of De beers marketing strategy, it's a diamond fact, a diamond is forever! Opals, coral, Persian turquoise, especially old opal jewelry, and expensive moonstone jewelry should be separated within their own pouch compartments; these softer stones should be stored separately, away from a girls' best friend. The hydrous nature of soft gemstones like moonstone, coral, opals, and the turquoise that you see in antique native American turquoise jewelry makes them vulnerable to scratches, sharp blows, hot water and household chemicals. Water and light can even change the color of turquoise and its' skin can easily, absorb body oils. Emerald rings, Antique Diamond engagement rings and sapphire rings should be stored upright in a ring tray and Emeralds should not be in constant contact with any cloth or absorbent surface. Although diamonds are the hardest of the gemstones, both old and new diamonds can be brittle and if a diamond is hit on a cleavage point, it can chip. Never allow your diamond jewelry to be stored loose or come into contact with other gemstones, as it will scratch them. Strands of cultured pearls should not be stored hanging, but should be stored so that these little pearls do not come into contact with each other. Hanging strands of pearls also weakens the silk due to the force of gravity. Store pearls flat, and if you have multiple strands of pearls, store in separate jewelry trays or with a padded liner between them, if you stack the strands. Cultured pearls and Natural Pearls are organic gemstones and unless you're an oyster you can't repair a pearl, therefore knowing information on how to care for your pearls is vital. Insuring your jewelry, allows you to recover the full value of a piece should it ever be misplaced or stolen; most people are unaware of the true replacement value of a treasure which has been in the family for generations. A photograph of your jewelry will help trace an item should you ever lose it.